At Huawei, we believe that the security of your privacy is just as important as producing the best product for our customers. Therefore, we focus on personal privacy protection at the beginning of each product design and extend this concept throughout the entire development process. Most of the personal data you store on your Huawei device (such as your photos, call logs, mailing list, messages, frequently visited websites, and so on) will be strictly protected. In addition, you will be clearly notified of any personal information being collected, and have complete control over the collection, processing, and sharing of your personal data. Without your authorization, your personal data will not be disclosed with any third parties. Continuously enhancing your user experience, while comprehensively protecting your personal privacy is our commitment, as well as our tireless pursuit. As you use our product, we will guarantee the security and privacy of your personal information and encrypt your personal data, whether transmitted or stored locally. For example, we will provide you with a separate encrypted space, PrivateSpace, which is completely isolated from your Main Space, so you can store your sensitive personal data for further protection. Whether you are messaging, watching videos, or using HiCloud, your personal data will never be disclosed to any third parties without your authorization. To provide you with the necessary services and personalized experiences, we may need to access certain information (such as your device ID, phone number, and so on). However, we would only collect the minimum amount of information necessary for our services. Please refer to the Privacy Statement to learn more about this process. To access your photos, contacts, and other personal data, the app is required to obtain your permission in advance. 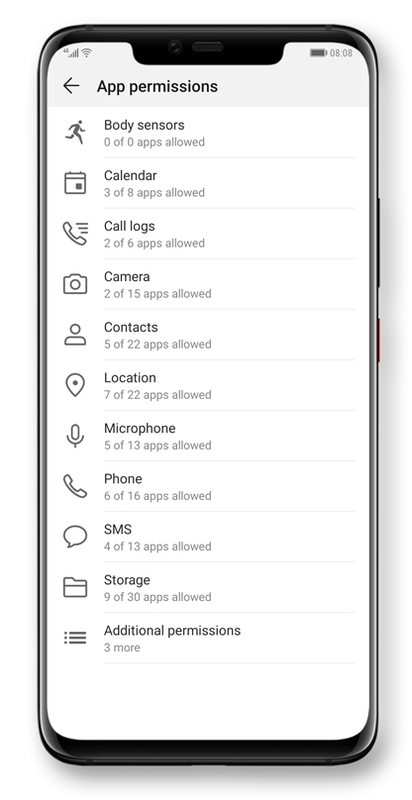 For the apps installed on your device, you can control the permissions applicable and allow or deny a permission requested by a certain app. For example, if an app is requesting to access your contacts, SMS, location, or other information, you can deny this request and prohibit it from accessing such information. Without your authorization, an app will not be able to access the protected resources and data on your device. We have integrated EMUI with a variety of encryption and anonymization privacy protection measures to securely protect the important information on your device and to provide you with necessary services and personalized experiences in the context of privacy compliance. We follow the principle of privacy, along with various built-in privacy protection measures to ensure the security of your personal information throughout the design of our products. Without your authorization, your personal information will never be disclosed to any third parties. 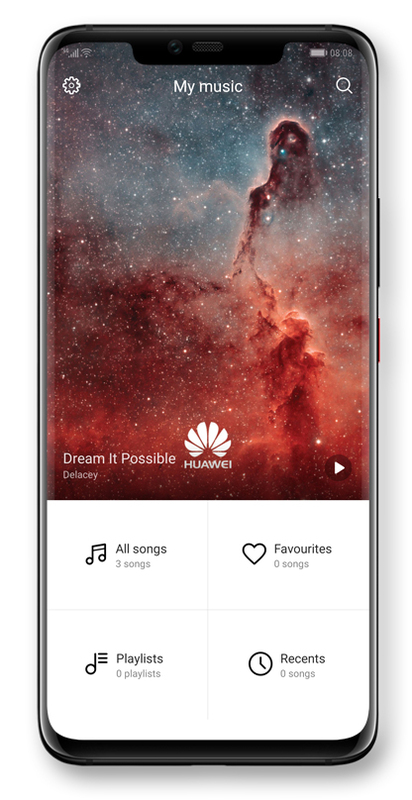 HUAWEI Music provides you with local music playback and online music streaming services in countries where they are permitted. When you play music locally, HUAWEI Music scans your local music files and records your playback history. However, this data is only stored on your phone. When you stream music online, HUAWEI Music collects, processes, and stores your music playbacks, membership purchases, and authorizations to provide you with a better user experience. HUAWEI Music also provides separate operational settings for parent and child accounts respectively, so parents can allow their kids to enjoy music with confidence. 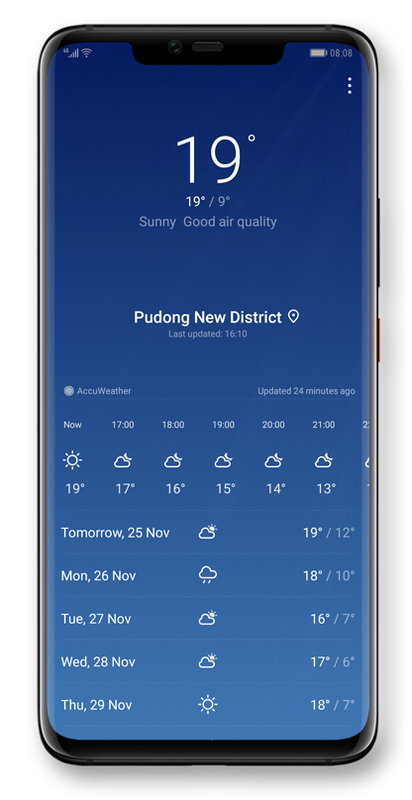 HUAWEI Weather provides you with accurate and up-to-date weather information and forecast services. 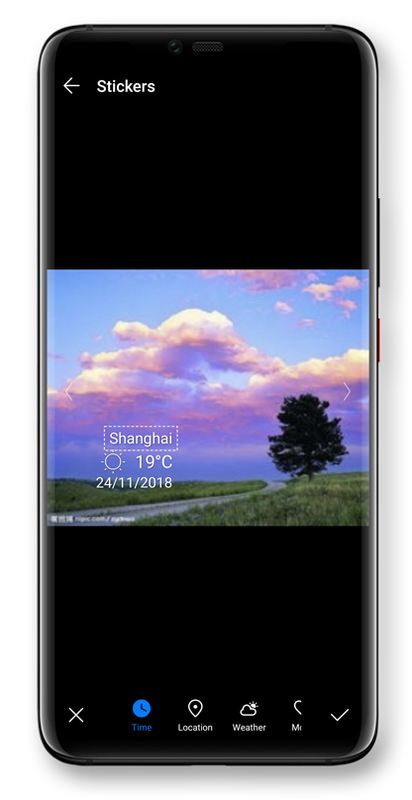 To provide you with weather information of your current location, HUAWEI Weather needs to collect and use the latitude and longitude data of your geographic position and send it to a third-party weather service provider to obtain the information. The use of your location information requires your authorization to take effect. 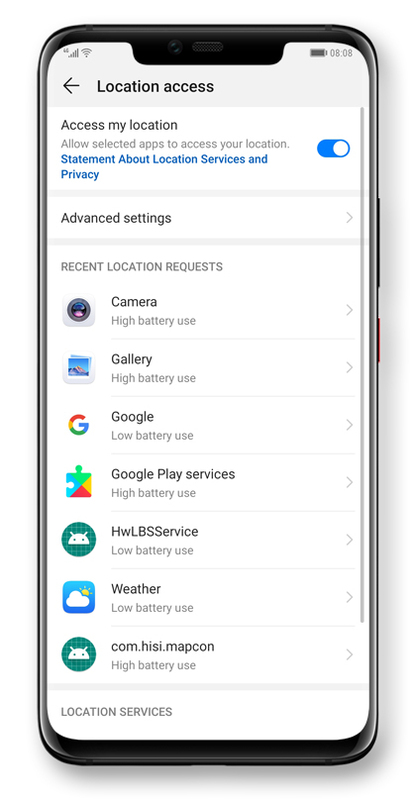 To protect your privacy, HUAWEI Weather and its third-party weather service provider will not store your location information. When you take a photo, you can choose to enable Watermark mode in your camera. Watermark mode can add various watermark effects to each moment you capture. Photo editing enables you to easily crop, rotate, apply filters, and add watermarks after your photos are taken. When you select a location watermark while taking or editing a photo, the watermark feature collects the geographic location of your current device and displays it on your photo. During this process, your device's location information will only be used for the placement of watermarks, and will not be used for any other purposes. The Business card scanning feature identifies the contact information on a business card and jumps directly to the editing screen to help you quickly save the contact. 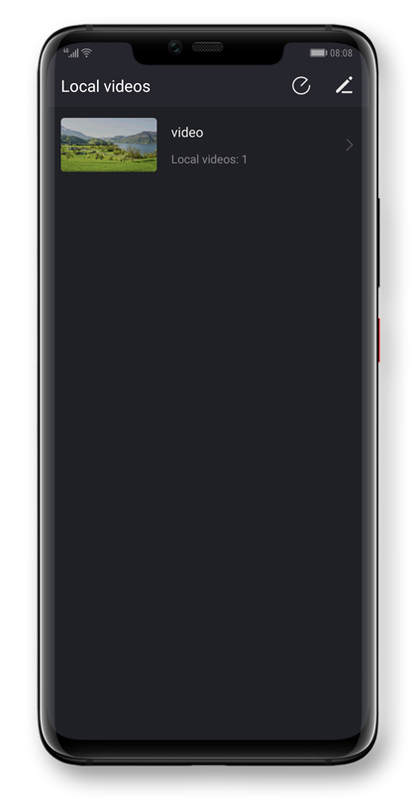 This local feature does not require a network connection, and does not upload data. 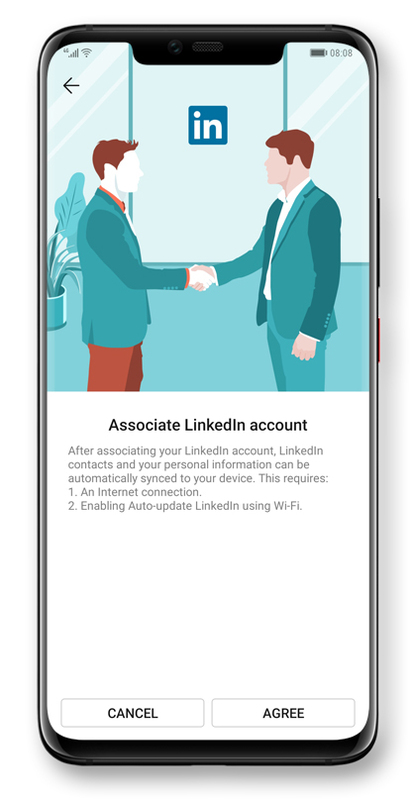 When you choose to associate a social account in your Contacts, the Contacts app will automatically sync the contact information of the social account to your phone. The data will only be stored locally and merged with your local contacts, and will not be uploaded. By unbinding a social account, you will clear all related data stored locally on your phone and disassociate the information from your local contacts. 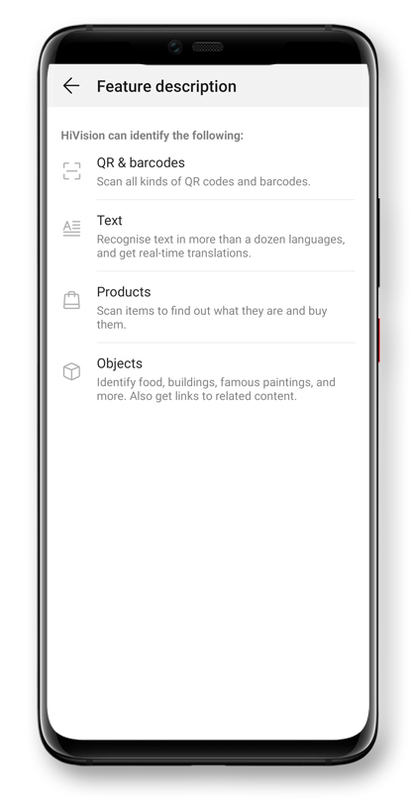 HiSearch is a built-in search engine that provides you with local content searches, browser-jumping searches, and other search-related services. Local searches will only retrieve and display contents stored locally on your device, and do not involve sending data to Huawei servers. Browser-jumping searches require an Internet connection to search for and display contents based on your keyword inputs. Huawei does not collect your keyword inputs, search history, and other data. HiVoice enables you to implement smart voice-activated commands on your phone, including Voice wake-up, answering calls, and more. 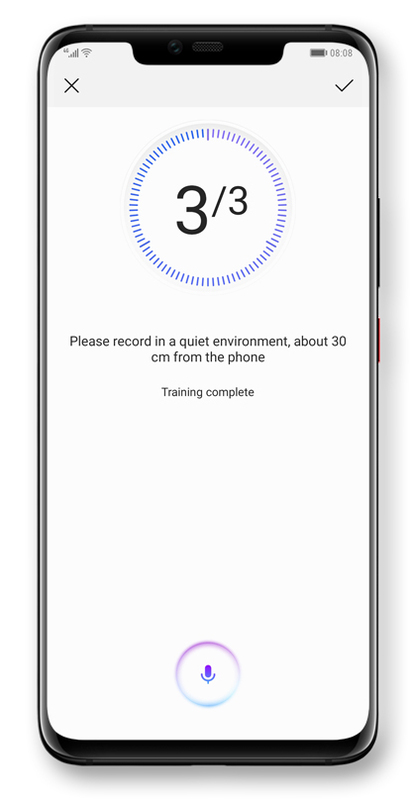 When HiVoice analyzes your speech data and executes your voice command, all data is processed locally on your device and will not be uploaded online. As we provide you with our personalized services, we focus on your privacy protection by informing you of data processing and enhancing the protection of your personal data. Your data is yours only, so we believe you should have complete control over the collection, processing, and sharing of your personal information. 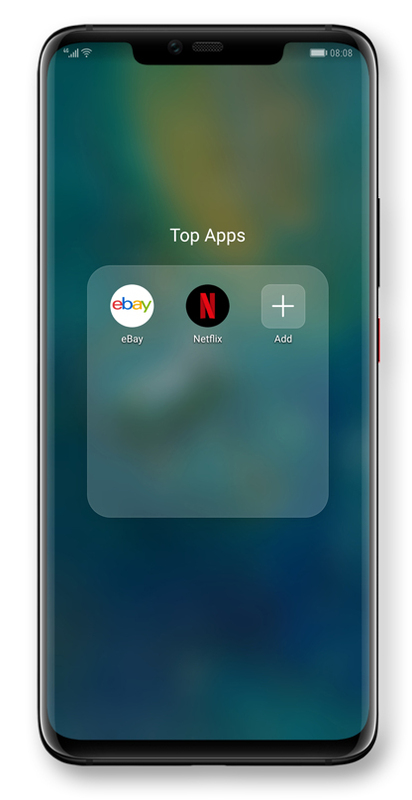 When you open AppAdvisor for the first time, we will ask for your consent prior to collecting and using your personal data to recommend apps to you. The apps that are recommended to you are only app icons that contain the apps' download links, which do not take up memory. 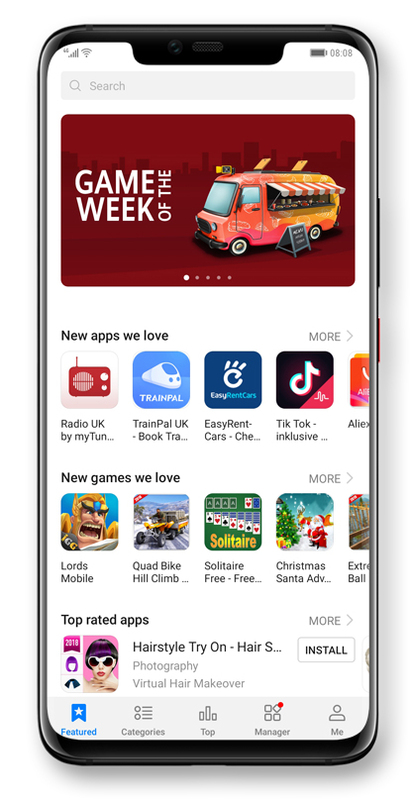 You can decide whether to download and install an app by accessing the corresponding download link or terminate the collection of your data by unsubscribing from the app recommendations service. HUAWEI AppGallery is the world's first app store to implement real-name authentications for app developers. It utilizes a four-layer protection mechanism to ensure app security and adopts an app rating system that conforms to international standards. Protecting your privacy is the number one priority of the Huawei ecosystem. Therefore, we do not collect and use your personal data without your consent, and will only collect the minimum amount of data necessary to complete related tasks. To provide you with a safe and refined user experience, Huawei strictly ensures that each app on HUAWEI AppGallery meets the requirements of the HUAWEI AppGallery Review Guide. By scanning your photo information locally on your device and creating an index to facilitate your searches based on the name, time, notes, location, and label of your photos, Gallery can generate your photo memories into an exciting album after analyzing the aggregation preferences. The entire process is carried out locally and does not involve the upload or modification of data. Gallery classifies your photos (such as people, landscapes, food, documents, etc.) locally on your device, and syncs the classified information when they are uploaded to Huawei Cloud. The entire process is encrypted and guarantees the security of your data transmission. 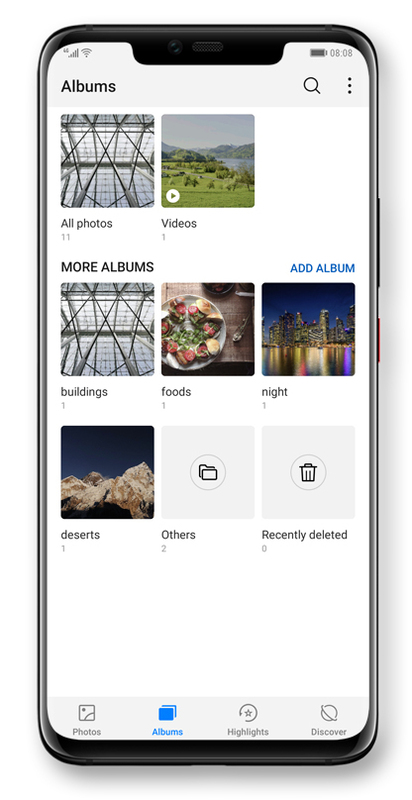 You can also select an album, photo, or video in Gallery to easily share it on a third-party app. Which apps you prefer to share on is completely up to you. Together with well-known content providers, HUAWEI Video provides you with rich online streaming content and the ultimate viewing experience. HUAWEI Video also provides you with local video playback and online video streaming services in countries where they are permitted. When you stream videos online, HUAWEI Video collects, processes, and stores your video playbacks, membership purchases, and authorizations to provide you with a better user experience. During this process, we will take appropriate security measures to ensure the security of your data. 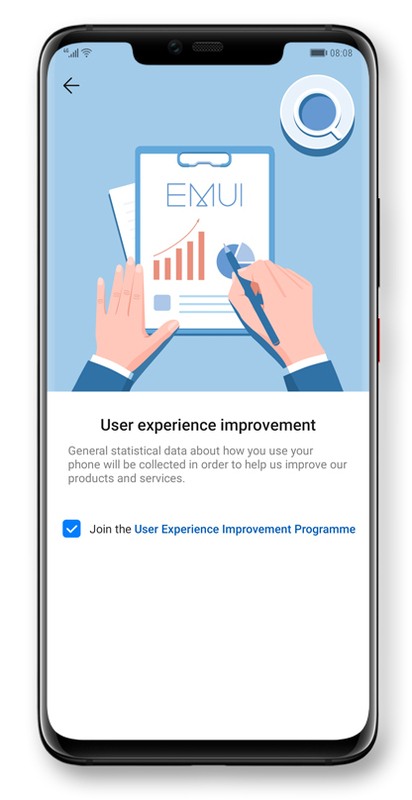 To provide you with the most reliable, smooth-running, power-saving software and hardware system for the ultimate experience, we will collect statistical data on the reliability, performance, power consumption, faults, and errors on your device, as well as data on how your device and apps are being used. Your data will only be sent to Huawei after we obtain your explicit consent. We utilize differential privacy technology to enhance your user experience and protect the data you share with Huawei. This technique adds random noises to the data to prevent us from recognizing your real data. Relevant statistics will only appear if combined with other large amounts of user data and the randomly added noises are removed through averaging. 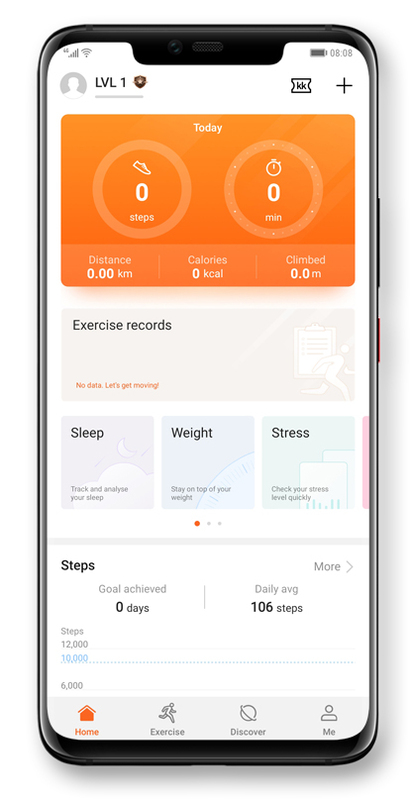 The HUAWEI Health app is your all-day fitness and health assistant, providing you with professional exercise records and fat-burning training courses, and combined with scientific sleep and health services, allowing you to run faster and further and become healthier. If you bind a wearable device or other health devices to the HUAWEI Health app, the steps, distance, trajectory, sleep, heart rate, and other data on the device will be encrypted and synced to your phone via the Bluetooth security protocol. Your personal data in the HUAWEI Health app will be encrypted with a random key that not even Huawei can decrypt and stored in your phone's internal memory. If you authorize us to collect and process your HUAWEI Health data, your data will be transmitted to Huawei Cloud via the internationally accepted HTTPS security protocol and encrypted with a dynamic key to ensure its security. HiVision provides you with Code-scanning, Translation, Shopping, Calories, Object recognition, and other services. • Code-scanning: Scans QR codes, barcodes, etc. • Translation: Provides translations for scanned texts. • Shopping: Facilitates your shopping by scanning and searching for similar products on relevant shopping platforms so you can compare prices and other information. • Calories: Scans foods and provides you with their nutrition facts, such as calories, weight, etc. • Object recognition: Helps you identify buildings, celebrities, plants, stores, etc. Among the preceding services, HiVision needs to convert the image captured by your phone camera to process and analyze the text content, and may require access to relevant apps or third-party service providers to provide you with the appropriate services. The stores identification feature of Object recognition may require access to your device's location to search for nearby establishments. 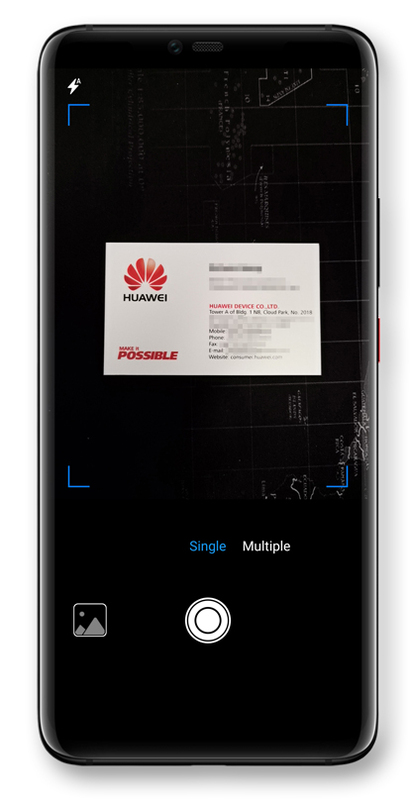 We ensure that the images, texts, and location information sent to Huawei servers or third-party service providers do not contain non-essential personal data; they are used only to provide the corresponding services and are not used for any other purpose. Relevant data are transmitted through a secure channel, while related images, texts, and location information are deleted within a specific period of time. To help you manage your privacy, we have provided you with a variety of tools and features. 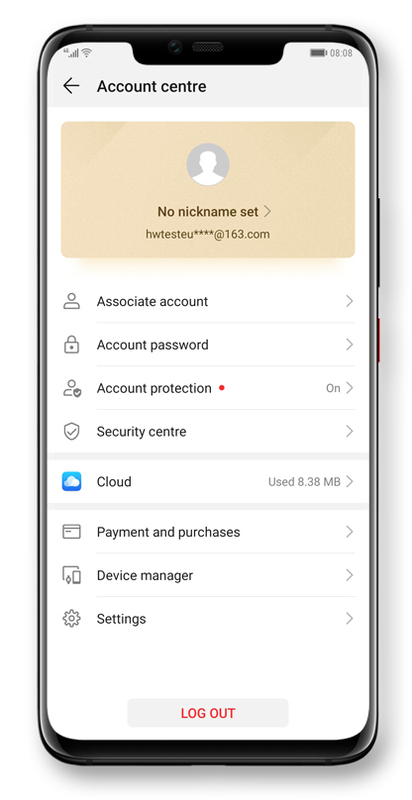 You can protect your device and HUAWEI ID, as well as have complete control over your personal data and location shared with other devices or apps. You can enhance the security of your device with a lock screen password. 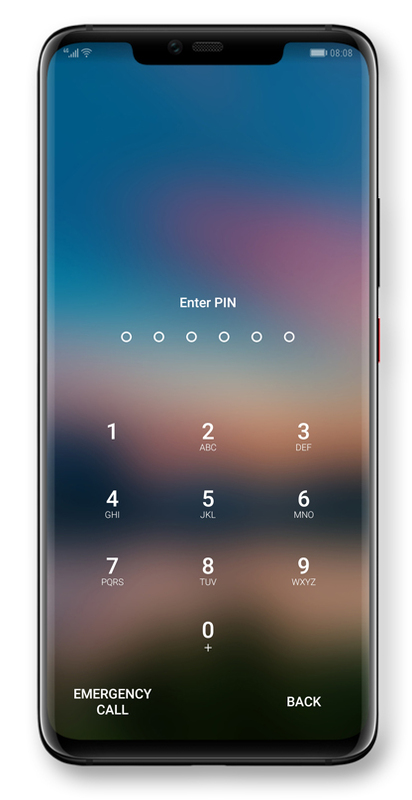 The lock screen password is stored in your device using an irreversible algorithm, and is protected by a unique device hardware key. The processing of the creation and verification of user lock screen passwords is performed on isolated hardware within your device, in a secure, trusted environment. EMUI also limits the number of acceptable password input errors to prevent brute force attacks. Your lock screen password will also be used to encrypt and protect your personal data, which can effectively prevent unauthorized access to your storage data without a password verification. When the user restarts their device, or has not entered their password for three consecutive days, the system will not allow screen unlocking via biometric authentication, such as face and fingerprint unlocking, and a password must be entered to unlock the device. Fingerprints are physiologically unique in each and every human being, and are mainly used for the purpose of identity verification and other important scenarios. You can use your fingerprint to verify your identity and unlock your device's screen. The entire process of fingerprint image entry and pre-processing, fingerprint feature extraction, fingerprint template generation, and fingerprint authentication are all conducted in a secure, isolated, and trusted environment. 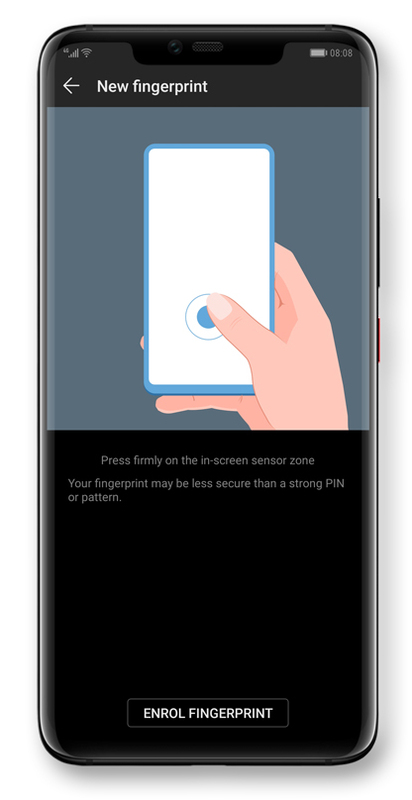 The fingerprint images will then be converted into feature templates, encrypted, and stored to a secure and isolated location that is not accessible by Android or any other apps. Your fingerprint data will maintain in the isolated zone and will not be stored to the cloud server or anywhere else outside of your device. 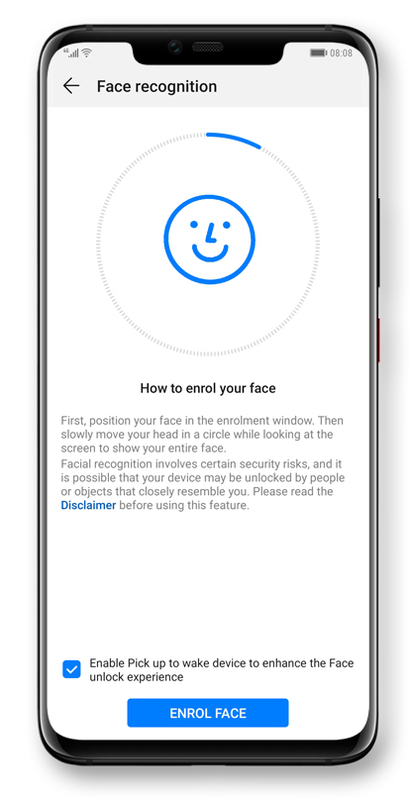 Face recognition is a biometric recognition technology based on the scanning and recording of the user's facial features to perform identification and unlocking procedures. You can use your face to verify your identification for purposes such as unlocking your device or confirming payments. All critical functions and processes, such as facial image acquisition, feature extraction, feature comparison, and feature data storage are performed entirely in a secure and isolated trusted environment. The feature templates converted from your facial features are encrypted and saved in a high-security zone under a high-intensity encryption algorithm. 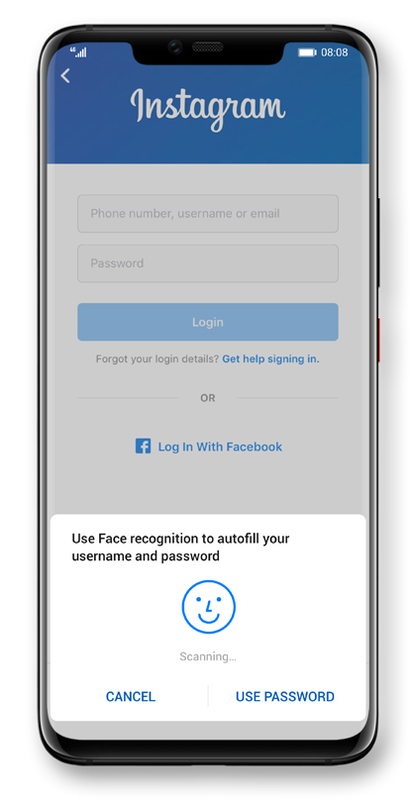 Your facial identification data never leaves your device and is never uploaded to the cloud server or stored anywhere else outside of your device. 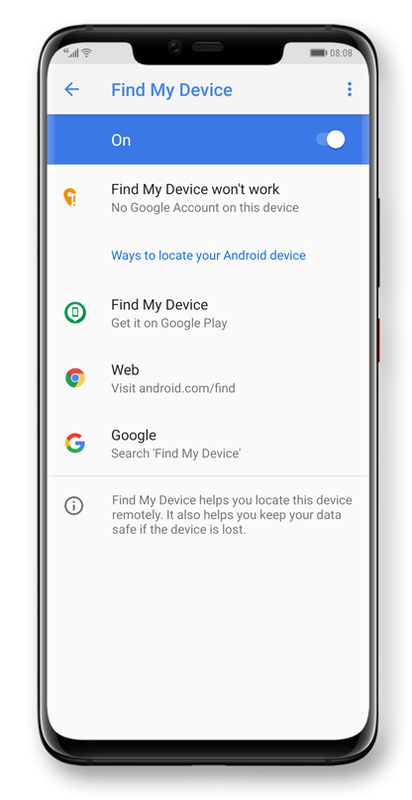 You can log in to your Google account through Google Mobile Services or the official Google website and use a similar service as Find My Phone. In addition, Huawei devices offer a Device activation lock feature. Device activation lock will automatically activate as soon as Find My Phone is enabled. If your device is lost and your stored data is forcibly cleared by an unauthorized user, Device activation lock will require your device to authenticate through your Google account in order to re-activate upon restarting. This prevents others from activating your device without your authorization. EMUI provides device authentication services for devices that are simultaneously logged in to the same HUAWEI ID, allowing you to perform security authentication over the LAN for trusted devices under the same HUAWEI ID. 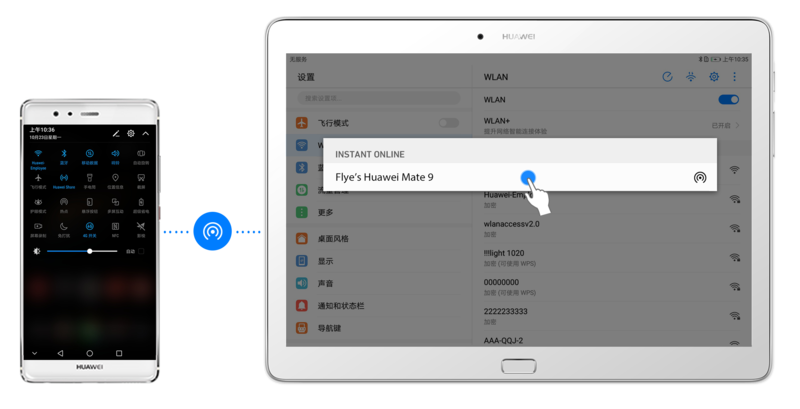 You can also securely share hotspots and files between devices that are simultaneously logged in to the same HUAWEI ID through Bluetooth and Wi-Fi P2P. Devices that are simultaneously logged in to the same HUAWEI ID use the trusted public key authentication protocol for authentication and authorization purposes, and to ensure the legality of devices. All data transfers between these devices are encrypted using a key negotiated by both parties, helping to protect the security of your data. To protect your privacy, we have provided you with a separate encrypted space that is completely isolated from your Main Space - your own PrivateSpace. The data in your PrivateSpace cannot be accessed by your Main Space. In your PrivateSpace, you can store your most important data, as well as conveniently transfer files (such as video, audio, and image files) between your PrivateSpace and Main Space. 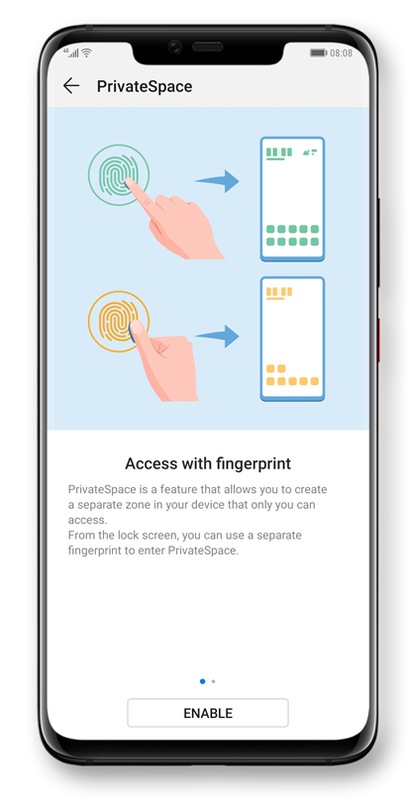 You can enter your PrivateSpace password or fingerprint from the lock screen for quick and easy access. There is no other way to access your PrivateSpace, so you can rest assured that your data is safe and secure from unauthorized users. PrivateSpace also provides a password reset function in case you forget your PrivateSpace password. After entering your PrivateSpace, going to Settings > Security & privacy > PrivateSpace > Password Protection and setting a PrivateSpace password, if you then forget your password, you can enter your Main Space, go to Settings > Security & privacy > PrivateSpace and touch Reset password to reset your PrivateSpace password. The Password vault provides you with the ability to save and automatically fill in app login and password information. App login and password information saved by the Password vault is only encrypted and stored on your device and will not be uploaded to the cloud. Your HUAWEI ID is used to access all available Huawei services. You can log in to your HUAWEI ID to access HiCloud, AppGallery, GameCenter, HUAWEI Video, HUAWEI Music, and much more. It is very important to protect your HUAWEI ID and to prevent unauthorized users from accessing your account. 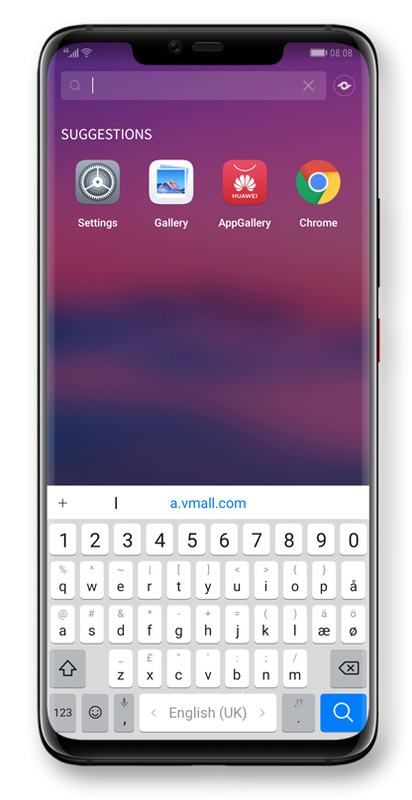 To accomplish this, Huawei requires users to create strong and uncommonly-used passwords that are at least eight characters in length without any spaces, and which contain at least two types of the following: letter, number, and symbol. Based on this rule, users can create passwords that are more secure by adding more characters and punctuations with a maximum limit of up to 32 characters. Two-factor authentication is an extra layer of account protection and the best way to keep your HUAWEI ID secure. With account protection, your HUAWEI ID can only be accessed from a trusted device. When you first log in to your HUAWEI ID on a new device, you will be required to enter both your password and a security verification code. Completing the verification means that you trust this device. For example, you already own a HUAWEI M2, and now you want to log in to your HUAWEI ID on your newly purchased HUAWEI P10. 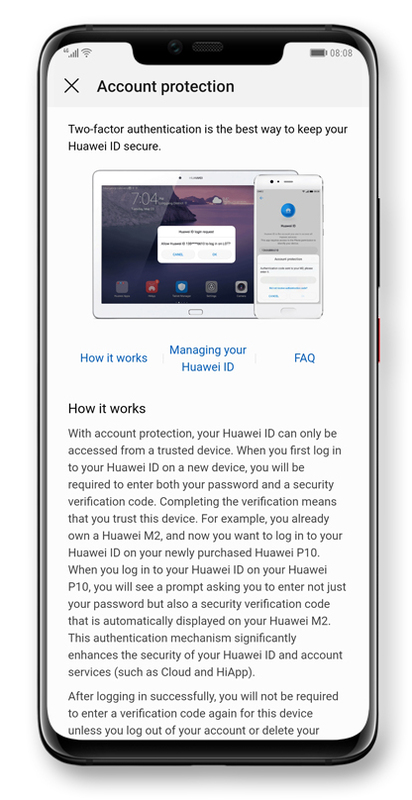 When you log in to your HUAWEI ID on your HUAWEI P10, you will see a prompt asking you to enter not just your password but also a security verification code that is automatically displayed on your HUAWEI M2. This authentication mechanism significantly enhances the security of your HUAWEI ID and account services (such as HiCloud, AppGallery, Wallet, and GameCenter). 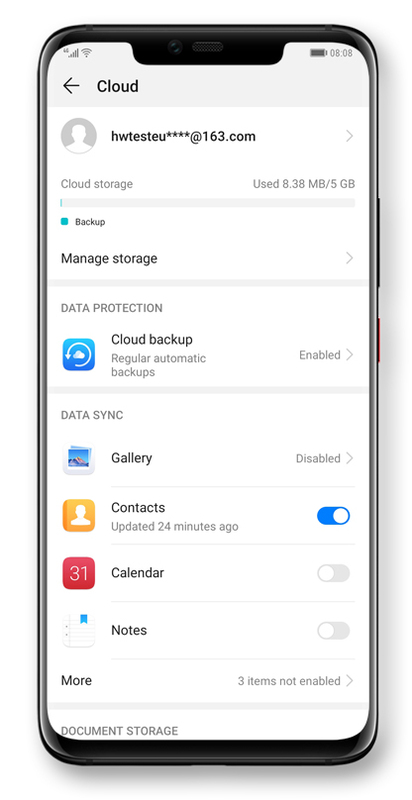 By enabling or disabling corresponding data options, you can control how backup data is synced between your device and HiCloud account. All synced and backup data in your HiCloud will be encrypted during the transmission process, as well as when being stored to Huawei servers. For data synchronization between devices, Huawei also uses end-to-end encryption technology, with the encryption key and data being stored separately so that even if the data storage is attacked and hacked, the data itself cannot be disclosed. For the apps installed on your device, you can control the permissions applicable and allow or deny a permission requested by a certain app. For example, if an app is requesting to access your photos, contacts, SMS, location, or other information, you can deny this request and prohibit it from accessing such information. Without your authorization, an app will not be able to access the protected resources and data on your device. Location services determine your location through GPS, Wi-Fi hotspots, base stations, and other resources to provide you with better services. When you enable location services, navigation guides and local weather information can be provided to you with precise accuracy based on your location. In addition, any app that attempts to access your location data would require obtaining your authorization in advance. When not needed, you can disable location services at any time.